Cannes competition picked up a bit of much-needed steam this morning, with Austrian provocateur Michael Haneke’s haunting, elegantly made “Amour” screening before a silent, rapt press. It took a sad film about an elderly Parisian couple (played by old-timers Jean-Louis Trintignant and Emmanuelle Riva, pictured above) coping with illness to calm critics who nearly trampled each other to get into the auditorium. “Stop pushing!” people yelled, while pushing. The movie sobered everyone up pretty quickly. I’ve had mixed reactions to Haneke over the years; some of his films have been stylistically rigorous but intellectually empty (2009 Palme d’Or winner “The White Ribbon”), while others have just been exercises in nose-thumbing (“Funny Games U.S.”, the American remake of his Austrian original). “Amour” is about fifteen minutes too long, and like nearly all of Haneke’s movies it never gives you the impression that the filmmaker is grappling with truly complex or original ideas. But here, the simplicity of the story – a man caring for his partly paralyzed wife – brings out a sincerity that feels new for the director. There’s no bullying of the viewer in “Amour”, and Haneke handles familiar, but harrowing questions of death and devotion with both grace and an utter lack of sentimentality. 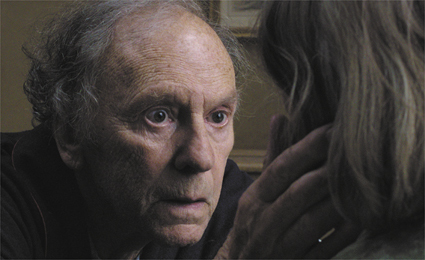 As a man faced with excruciating decisions, 81-year-old Trintignant gives a shattering performance. He’s a frontrunner for the Best Actor prize. 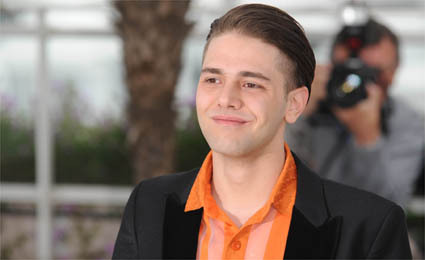 On an unrelated note - and at the other end of the age spectrum - I had the opportunity to sit down with Xavier Dolan, the 23-year-old Quebecois director of “Laurence Anyways”, for a chat at his hotel. The film, an epic about a man who decides to change sexes and the woman who loves him (read my review here), screened in sidebar category Un Certain Regard and divided critics. It’s still the best thing I’ve seen so far this year at Cannes. Here are highlights from our conversation. Where did the idea for “Laurence Anyways” come from? A crew member on my first film “I Killed My Mother” once told me about her boyfriend. She said they were in a restaurant, and he told her: “I want to become a woman. Will you stay with me?” I was breath-taken, and immediately started typing the film in my mind. When I got home, I wrote 30 pages. Why did you cast a French actor, and not a Canadian, in the title role? I met [French star] Louis Garrel and we really had fun together, so I wrote this part for him - with his energy in mind, his voice, his humor. And then he bailed out at the very last minute. That happens, and it’s OK. We had to find someone else quick, because we had spent so much money in pre-production and preparation that we couldn’t afford to postpone the shoot. And Melvil Poupaud, thank God, accepted and was free. Two days later he was in Montreal. Some critics have slammed your use of music. A few said “Laurence Anyways” is like one long over-aestheticized music video. What’s your reaction? I sometimes write scenes for the mere use of a song. Music is not dissociable for me from moviemaking. Music was the soul of cinema for so long before sound in film. Just ask Jean Dujardin [star of last year’s silent movie hit “The Artist”]! Music can hit you in a personal way when you’re watching a film. You may think: “Where was I when I first heard that song?”. So music can create collaboration between the movie and the audience. I’m not just trying to relentlessly play my iTunes library. I’m trying to make the movie live a bit. These are not just aesthetic choices; they’re emotional choices. And I don’t think about placing my camera. I haven’t seen Almodovar films. I’m trying to seek beauty, and sometimes it’s not intentional. What directors did you grow up admiring or do you admire now? Very few when I was growing up, because I was not a cinephile. I did not have a father who took me to the cinema or showed me Ingmar Bergman films. I started to see serious films when I was 17. Before that it was stuff like “The Mask”, “Batman Returns”, and all the Disney classics. Later, movies by Jonathan Demme [director of “The Silence of the Lambs”, “Philadelphia”, “Rachel Getting Married”] showed me the kind of close-ups I loved and that I use now: very little depth-of-field, a sensation of surveillance. And Paul Thomas Anderson is my hero. He’s a genius. And we have a lot of things in common. Your films deal with gay themes. What do you think about the portrayal of homosexual characters and stories in cinema today? I’ve always told impossible love stories. Homosexuality is not a priority for me. I think underlining those differences is going backwards. I don’t want to do “gay movies”, I just want to do my thing. My movies have been enjoyed by a lot of straight people. Of course, homosexuality is part of my movies, because it’s part of me. But there’s no message in my movies. If it can help people to see my films, that’s a really great thing. But I have no mission. Do you have any desire to do movies in Hollywood? What actors or actresses would you like to work with? Sure! But I’d rather wait to have the power to arrive in Hollywood and give my own script to a studio. I don’t want to direct some studio script, and end up not wanting to be credited. As for people, I’d love to work with Meryl Streep, Kate Winslet, Charlize Theron, Alec Baldwin, or Glenn Close. I wanted so badly to work with James Franco. But after a while, you get tired of not being answered, and of meeting someone eight times but them not remembering you, and of managers just postponing things all the time. I think he’s a great actor, though, and I would have loved to give him a role. Jon Frosch, thank you for your review of Laurence Anyways. I bet it's the kind of film you like even more on a second viewing.....a la Heartbeats. Now fingers crossed the film gets a semi-wide distribution, at least. I'm a straight woman and I love Xavier Dolan's previous films and am sure I will love Laurence Anyways. If the film had been part of the main competition, I think Melvil Poupaud would have had a fighting chance to win the Palm d'Or for best actor. Dolan also deserved a pop at for Best Director, but, that would have hurt the old fogeys too much. It seems they are jealous of him so they keep him at arms length. Jealous of his art and of his youth imo. I actually hope Dolan doesn't make it so big that he becomes part of Hollywood. I mostly hate 9 out of 10 films produced by Hollywood because they are totally forgetable films, and I am also incredibly sick of the ususal Hollywood faces, including the actors Dolan has cited as ones he would like to work with. Please God, no!!!!! He's even a much better actor than James Franco imo. 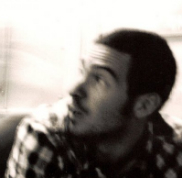 From the looks of it, Franco is also rude and too self-important, typica Hollywood. I am also a great admirer of Jean- Louis Trintignant, loved him in so many films, The Conformist, A Man and A Woman, My Night With Maud etc, and am looking foward to seeing him in a Haneke film. He actually deserves a Lifetime Achievement Award, in my opinion. Trintignant is a Legend.